High standards reign supreme at High Bank Distillery. While the local beer industry has exploded, the number of distilleries that call Cbus home hasn’t quite kept pace. So High Bank Distillery, with its creative cuisine and superb spirits, is a welcome addition to the Grandview restaurant scene. 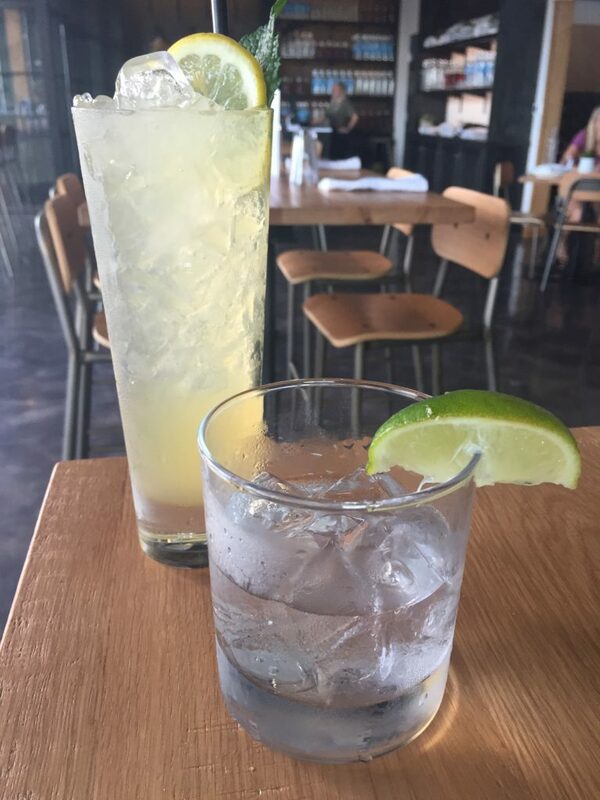 Named for the location where construction began for the fledgling capital city (on the “high bank” above the Scioto and Olentangy Rivers) this newcomer has more approachable eats than its respective counterparts Watershed and Middle West Spirits. But this bar food isn’t boring; High Bank Distillery’s dishes and drinks are equally craveable. 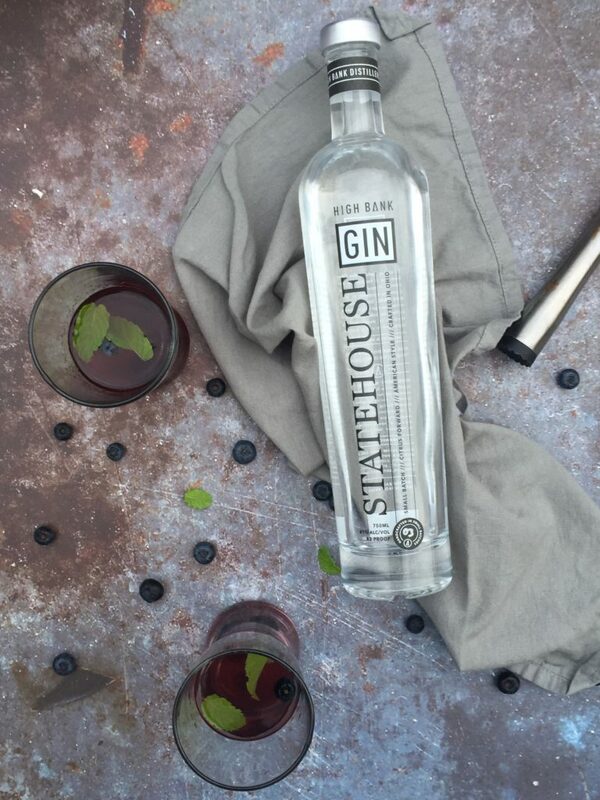 For the libations, I especially enjoyed the Statehouse gin. Our server explained that the gin was more of an American style, rather than a drier, traditional variety. Plus, I don’t normally notice things like this, but the bottle labeling is really beautiful! Try a liquor flight to sample High Bank’s own vodka and whiskey as well as the gin, or just proceed to cocktails. The Blackberry Mint Julep, the Engleside Iced Tea (gin, citrus-infused vodka, tea syrup, and lemon), and the Old Fashioned were all favorites in our group. Let’s forge on to the food. I have a weakness for appetizers, and often order a slew of them for my meal. This visit was no exception! The Spice-Rubbed Carrots were a healthy and flavorful starter, featuring charred carrots served alongside a tasty mound of thick hummus and sprinkled with pine nuts. The Tempura Shishito Peppers sport a slather of spicy mayo that no one sane could resist, but our favorite was the nachos. As a self-proclaimed nacho maven, I liked the unique twist High Bank put on this offering, and it is available with BBQ jackfruit (vegan) or pork, in addition to queso, smashed avocado, pico de gallo, and Ohio-made Shagbark chips. We went with the jackfruit to attempt a sweet and salty combo, and handily devoured the generous portion. 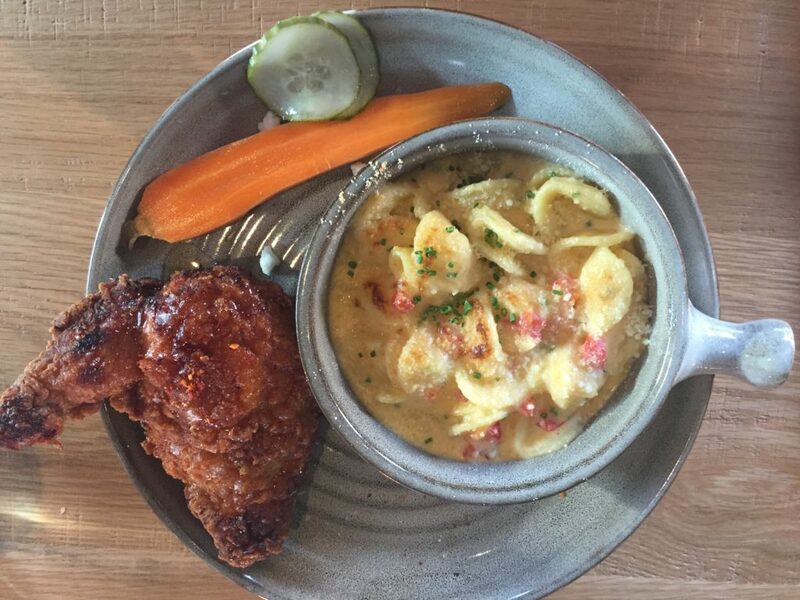 As for entrees, you can’t miss with the Buttermilk Fried Hot Honey Chicken, served with pimento mac and cheese. You must also order the Pineapple Split – it reminds me of something they would’ve had on the menu at the famed Kahiki restaurant. 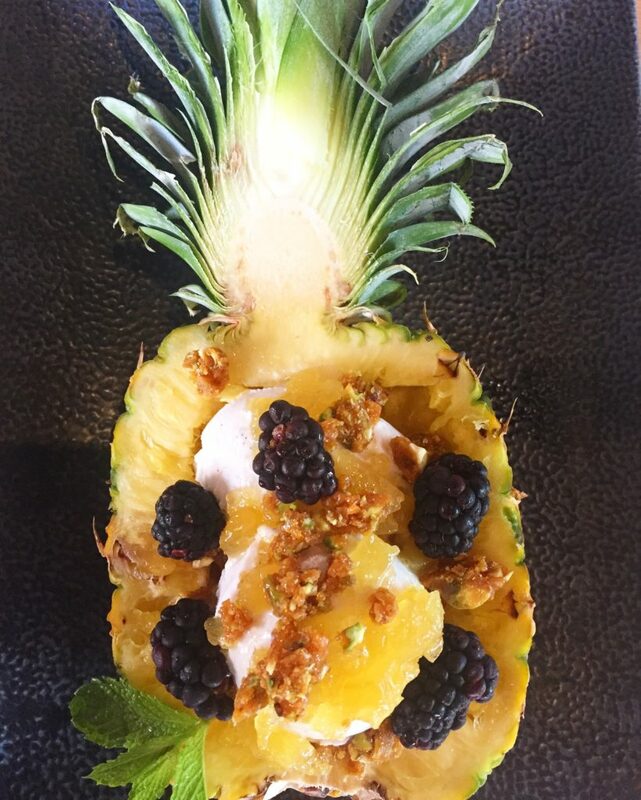 This confection is a feast for two: a hollowed out pineapple half is stuffed with delectable vegan coconut ice cream, berries, pineapple jam, pistachio brittle, basil, and mint. I’ve got my eye on the brunch too – bourbon cream donuts and blueberry buckwheat pancakes here I come. Culinary Clue: Parking near the distillery can be tricky. Give the parking guide from their site a glance before you head out, so you can determine the closest lot. No one wants to enjoy a great meal, then follow it up with a towed vehicle. Have you checked out this newish spot yet? Send me an Instagram message and let me know your favorite menu item!